Judging by eur usd analysis, the EUR/USD currency pair keeps moving upwards ignoring all kinds of the reversal signals and patterns. For as long as the price hasn’t reached a new maximum, the scenario with the descending corrective movement with the approximate targetof in the area of 1.3480-1.3400 still remains in effect. 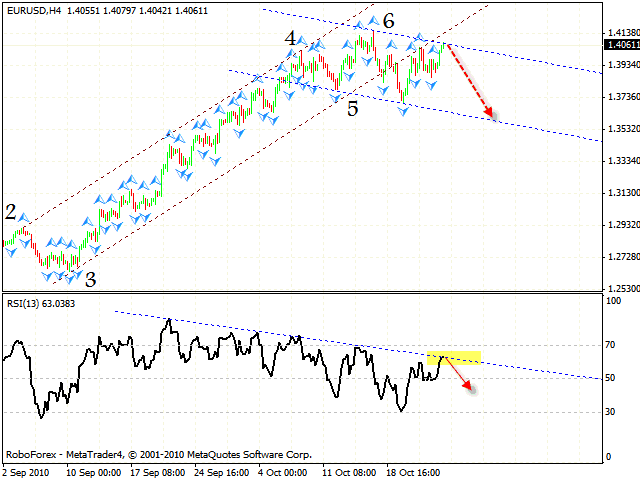 At the H4 chart the RSI faced the resistance from the trend’s descending line, which means that the rate is falling. Also there is a descending channel and at the momentthe pair is testing its upper border. One can try the tight stop sales. In case the channel is broken, there is a strong possibility that the price will reach new local maximum. 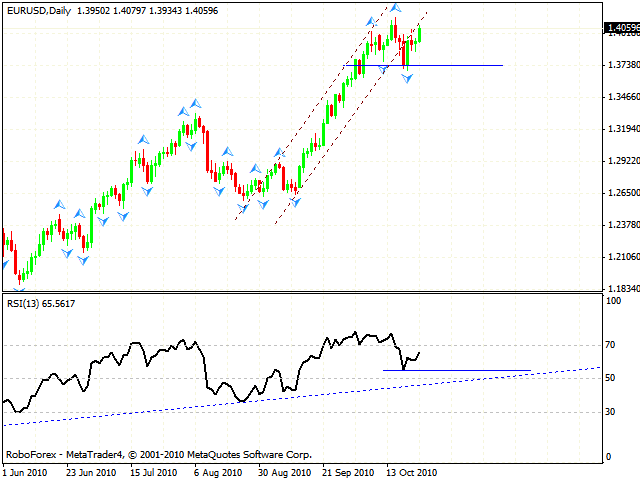 The daily online forex chart shows us “failure swing” reversal pattern forming at the RSI indicator. The target of the fall is the level of 1.3728.If it happens, we will see the breaking of the support level at the RSI long before the price breaks it, because at the moment the signal is just being formed. Now let’s take a look at the Dollar Index. The market has already defined the place for the 4th point of reference, so we should expect the Index to grow into the area of 80. Only after that we will see a new falling wave of Dollar. Thus there are signs of the correction, but we should wait for the formation of the reversal signals. At the moment the idea that the New Zealand Dollar is starting to fall still remains in effect. 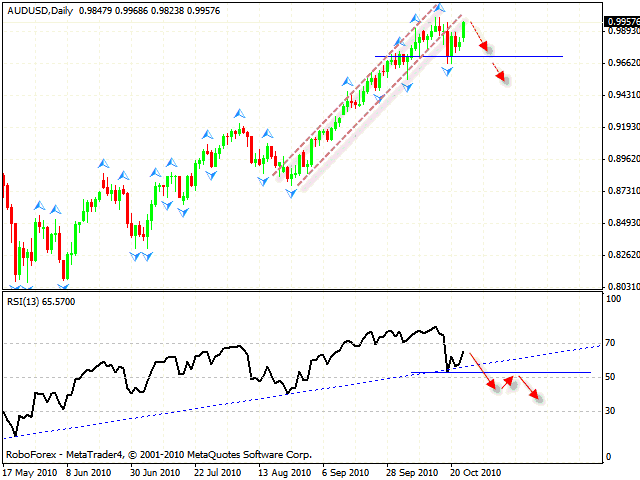 The RSI indicator is testing the trend’s broken line, which means that the price is going to move down. 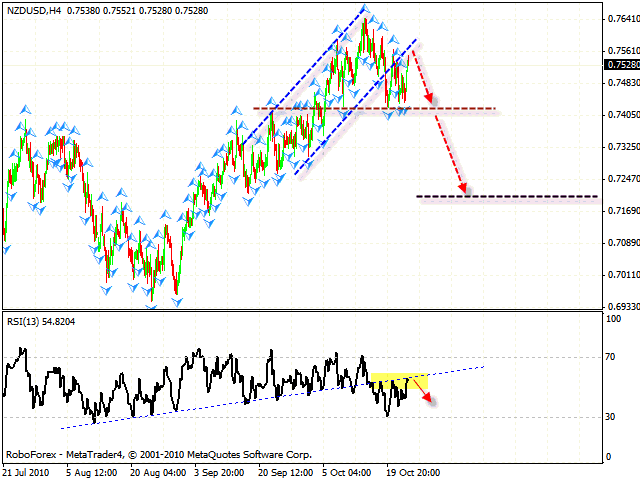 If the pair reaches and surpasses the level of 0.7590, it will cancel this scenario, according to nzdusd forecast. In case of the AUD/USD currency pair we can see “failure swing” pattern forming at the daily chart. 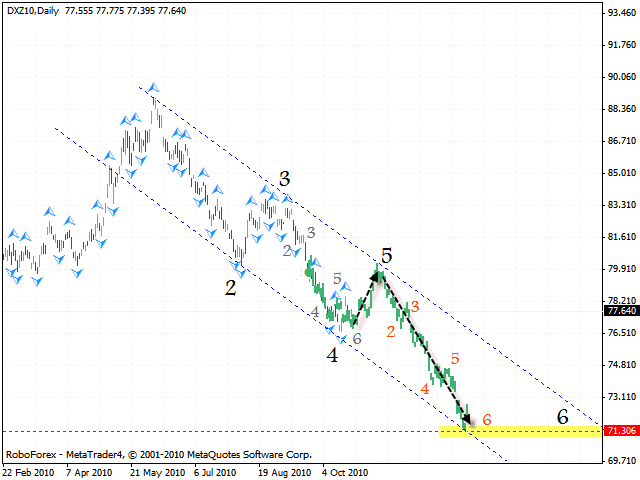 The target of the fall is the area of 0.9700. We shouldn’t talk about the reverse until the support level is broken at the indicator. As we can see by aud usd analysis, there is also a possibility of the formation of “double top” reversal pattern with the target of 0.9400.